The Fastest Man Alive continues his monumental run in DC Universe Rebirth! Barry Allen must get his powers under control and battle terrifying new villains before they both kill him. Dark clouds gather around Barry and his new family when the citizens of Central City meet Negative-Flash. The Flash sets out to save everyone he has ever loved from Negative-Flash, but there's just one problem: he is Negative-Flash! Barry Allen experiences the most brutal fight of his life when he faces off against Bloodwork, a gruesome new villain. Making things worse is that this unstoppable threat is all Barry's fault! 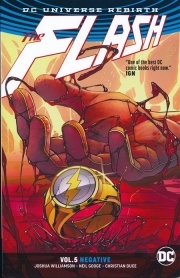 Witness the penultimate act of the Negative-Flash story and the beginning of an unforgettable new chapter in Barry Allen's life.